Lower lid entropion is a common condition in elderly individuals; the prevalence increases steadily with age. Entropion is an inversion of the eyelid (ie, inward turning of the eyelid margin) toward the globe. According to its anatomic features, the condition is classified as involutional, cicatricial, or congenital. Choice of surgical approach is directed by the underlying etiologic factor(s). Entropion occurs most often in the lower eyelid. The condition may be mild or severe, and it usually involves the entire eyelid margin. Entropion is more frequent in women then in men. This disparity may be related to the relatively smaller (on average) tarsal plates of women. Entropion is most commonly observed as an involutional change associated with horizontal laxity of the involved eyelid. Congenital entropion is rare and usually involves the lower lid. The cause is often a vertical deficiency of the posterior lamella. They found that patients with involutional entropion have smaller-than-average tarsal plates for their ages. Involutional entropion results from the vector mechanical effect of an atrophied or smaller-than-average (partially or fully disinserted) tarsal plate being overcome by the normal or increased tone of the preseptal/pretarsal orbicularis muscle. Patients with anophthalmic socket may have involutional entropion because of enophthalmic socket. Patients with involutional ectropion have larger-than-average tarsal plates for their ages. Involutional ectropion results from normal or larger-than-normal tarsal plate vector forces mechanically overcoming the normal or decreased tone of the preseptal/pretarsal orbicularis muscle in combination with medial/lateral canthal tendon laxity. Cicatricial entropion results from scarring of the posterior lamella by conditions such as alkali burns, trauma, blepharoplasty, and ocular cicatricial pemphigoid. Entropion is rare in individuals younger than 60 years, and one of the most common causes of cicatricial entropion in the industrialized world is Stevens-Johnson syndrome. Spastic entropion may occur with severe blepharospasm or hemifacial spasm. Causal factors leading to entropion include horizontal laxity of the eyelid (universal), dehiscence of the lower eyelid retractors, vertical shortening of the posterior lamella of the eyelid, and spasm or overactivity of the orbicularis oculi muscle. Presentation is usually because of epiphora, ocular irritation, or cosmesis. Indications for surgery to correct entropion include epiphora, ocular irritation, cosmesis, and corneal damage. Thorough knowledge of eyelid anatomy is essential to appreciate the etiology and surgical intervention of lower eyelid abnormalities. The eyelid can be conceptualized to consist of an anterior and posterior lamella. The anterior lamella consists of the skin and orbicularis muscle. The thin, delicate skin of the eyelid lacks dermal-like connective tissue and pilosebaceous apparatus that would reduce eyelid mobility. The orbicularis muscle is categorized as orbital or palpebral portions, based on adjacent anatomic structures. The orbital orbicularis muscle overlies the orbital rim. The palpebral orbicularis muscle is classified further as preseptal or pretarsal, based on the proximity of orbital septum or tarsus, respectively. At the eyelid margin, a strip of orbicularis muscle is associated directly with the eyelashes. This strip is the Riolan muscle. The posterior lamella consists of the eyelid retractor, tarsus, and conjunctiva. The lower eyelid is analogous to the upper eyelid, with the eyelid retractor system as the main variation. The upper eyelid has a distinct eyelid retractor (ie, levator muscle) to enhance upper eyelid mobility. The lower eyelid does not have a specialized eyelid retractor. The lower eyelid retractor system originates as a fascia extension of the inferior rectus muscle (capsulopalpebral head). This fascial system splits to encapsulate the inferior oblique muscle and then reunites to form a dense fibrous sheet (capsulopalpebral fascia) to insert onto the inferior tarsal border. The inferior tarsal muscle is a smooth muscle analogous to the superior tarsal muscle (Müller muscle) of the upper eyelid. This muscle originates in the inferior fornical area and extends toward the inferior tarsal border but does not insert on the tarsal border as does its counterpart in the upper eyelid. The inferior tarsal muscle provides sympathetic innervation to the lower eyelid, and interruption of its innervation results in a slightly elevated position of the lower eyelid margin, as observed in Horner syndrome. Otherwise, the inferior tarsal muscle has little pathologic significance. The tarsus provides the primary support or foundation for the eyelids. Although degeneration of the tarsus may promote eyelid laxity, the principle focus of weakness of the eyelids is at the lateral and medial canthal tendons. The medial canthal tendon has a prominent anterior component firmly connecting the medial canthal angle to the maxillary process of the frontal bone. The posterior limb of the medial canthal tendon provides deep support to the posterior lacrimal crest. The superior branch of the medial canthal tendon also supports the canthal angle. The lateral canthal tendon has contributions from the lateral aspects of the tarsus and the preseptal and pretarsal orbicularis muscle; these insert on the inner aspect of the lateral orbital rim at the Whitnall (lateral orbital) tubercle. 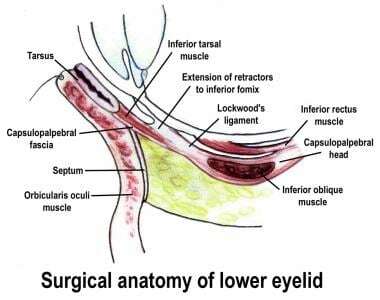 The posterior deep insertion of the lateral canthal tendon allows the lateral aspect of the eyelids to approximate the globe. Surgery to correct entropion is contraindicated in patients who are unable to tolerate the procedure. Damasceno RW, Avgitidou G, Belfort R Jr, Dantas PE, Holbach LM, Heindl LM. Eyelid aging: pathophysiology and clinical management. Arq Bras Oftalmol. 2015 Oct. 78 (5):328-31. [Medline]. [Full Text]. Bashour M, Harvey J. Causes of involutional ectropion and entropion--age-related tarsal changes are the key. Ophthal Plast Reconstr Surg. 2000 Mar. 16(2):131-41. [Medline]. Michels KS, Czyz CN, Cahill KV, Foster JA, Burns JA, Everman KR. Age-matched, case-controlled comparison of clinical indicators for development of entropion and ectropion. J Ophthalmol. 2014. 2014:231487. [Medline]. [Full Text]. Serruya LG, Nogueira DC, Hida RY. Schirmer test performed with open and closed eyes: variations in normal individuals. Arq Bras Oftalmol. 2009 Jan-Feb. 72(1):65-7. [Medline]. Boboridis KG, Bunce C. Interventions for involutional lower lid entropion. Cochrane Database Syst Rev. 2011 Dec 7. CD002221. [Medline]. Roberts MA, Baddeley P, Sinclair N, Lane CM. The lower lid diamond: a simple entropion repair to correct both horizontal and lower-lid retractor laxity. Ophthal Plast Reconstr Surg. 2012 Jan. 28(1):44-6. [Medline]. Jang SY, Choi SR, Jang JW, Kim SJ, Choi HS. Long-term surgical outcomes of Quickert sutures for involutional lower eyelid entropion. J Craniomaxillofac Surg. 2014 Dec. 42 (8):1629-31. [Medline]. Roberts MA, Baddeley P, Sinclair N, Lane CM. The lower lid diamond: a simple entropion repair to correct both horizontal and lower-lid retractor laxity. Ophthal Plast Reconstr Surg. 2012 Jan-Feb. 28(1):44-6. [Medline]. Carruthers J, Carruthers A. Botox: beyond wrinkles. Clin Dermatol. 2004 Jan-Feb. 22(1):89-93. [Medline]. Malhotra R, Yau C, Norris JH. Outcomes of lower eyelid cicatricial entropion with grey-line split, retractor recession, lateral-horn lysis, and anterior lamella repositioning. Ophthal Plast Reconstr Surg. 2012 Mar. 28(2):134-9. [Medline]. Ben Simon GJ, Molina M, Schwarcz RM. External (subciliary) vs internal (transconjunctival) involutional entropion repair. Am J Ophthalmol. 2005 Mar. 139(3):482-7. [Medline]. Lim WK, Rajendran K, Choo CT. Microscopic anatomy of the lower eyelid in asians. Ophthal Plast Reconstr Surg. 2004 May. 20(3):207-11. [Medline]. Piskiniene R. Eyelid malposition: lower lid entropion and ectropion. Medicina (Kaunas). 2006. 42(11):881-4. [Medline].